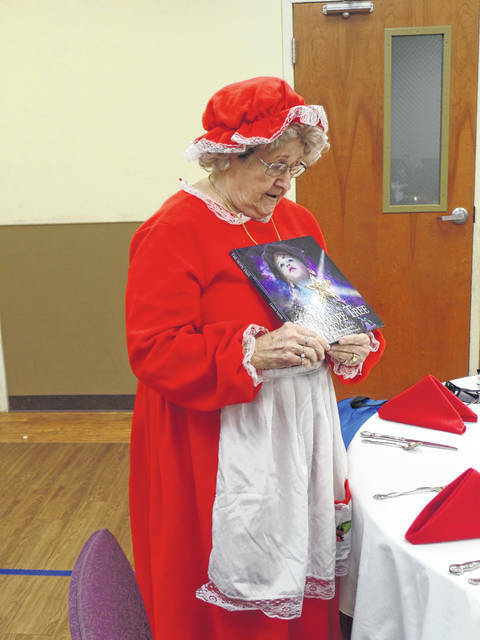 Vickie Powell reads a Christmas story as Mrs. Claus. Retired teachers Gail Belville, Karen Cornell and Lois Carter stand during the fundraising auction. 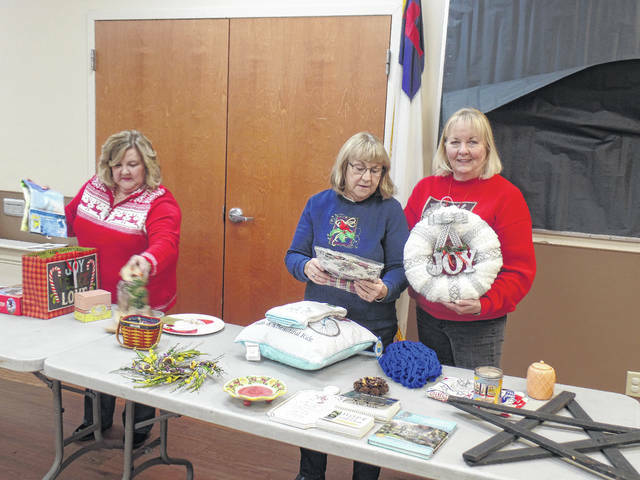 VINTON — The Gallia County Retired Teachers organization met on Dec. 7 at the Vinton Baptist Church. The meeting was called to order by President Ollie Paxton Tipple. The Pledge of Allegiance was led by Doris Lanham and the blessing was given by Henry Dillon. Forty-one members and guests were in attendance. All enjoyed a lunch prepared by the ladies of Vinton Baptist. November and December birthdays were recognized as follows: Karen Cornell, Henry Dillon, Denise Richards, Sara Spurlock, Vickie Powell and Debbie North. Sympathy cards were sent to the Burleson family, Nancy Preston and Hazel Carico. Judy Burdell sent a thank you card to the membership in appreciation for our get well wishes and prayers. Money was collected for the service project (Snack Pack) and the scholarship fund. Jack James gave the treasurer’s report and the minutes for the October meeting (which were included in the last issue of The Slate newsletter) were both approved. Ollie Tipple announced that new officers needed to be nominated for 2018. Tipple and Treasurer Jack James agreed to remain in their positions for another one-year term. Henry Dillon nominated them for their respective offices for 2018. Marlene Hoffman seconded the motion and it was approved by the membership. Both the secretary and vice-president positions are in need of being filled. Donna DeWitt, publicity chairman and editor of The Slate, announced that she is resigning and those positions will need replaced as well. The next meeting will be held on February 8, 2018 at the Golden Corral in Gallipolis. The program is unknown at this time. Upon adjournment of the business meeting, Vickie Powell entertained the group as Mrs. Claus. She shared the book The Hope Tree written by Leeann Smith. It is a Christmas story using scripture from Isaiah. The annual Christmas fundraising auction concluded the program. Gail Belville was the auctioneer. Numerous items went up for sale. Beth James, Lois Carter and Karen Cornell assisted with the auction. Members and guests attending were: Kay Adkins, Jessie Barcus, Gail Belville, Lois Carter, Jean Cassidy, Irene Clark, Jim Clark, Karen Cornell, Mary Deel, Donna DeWitt, Henry Dillon, Pat Dillon, Julie Dragoo, Sheryl Fallon, Dallie Forgey, Glenn Graham, Jackie Graham, Marlene Hoffman, Nancy Hood, Beth James, Jack James, Doris Lanham, Jean Mink, Herb Moore, Debbie North, Ollie Paxton Tipple, Denise Payne, Bob Powell, Vickie Powell, Debbie Rhodes, Denise Richards, Patsy Schuldt, Jane Ann Slagle, Roy Sprague, Mrs. Sprague, Gene Spurlock, Sara Spurlock, Chris Williams, Robbie Wilson, Alberta Lewis Riggs, Evie Stumbo. https://www.mydailytribune.com/wp-content/uploads/sites/42/2017/12/web1_SAM_6881-1-.jpgVickie Powell reads a Christmas story as Mrs. Claus. https://www.mydailytribune.com/wp-content/uploads/sites/42/2017/12/web1_SAM_6889.jpgRetired teachers Gail Belville, Karen Cornell and Lois Carter stand during the fundraising auction.